We have been and continue to be involved in the research and development of many large scale research grade and commercial grade instruments. Several of the instruments have been detectors for IR gas sensing, either for natural gas or medical applications. Another example is the laser calibration system for major US DOE basic high energy physics experiments and other related experiments around the world. 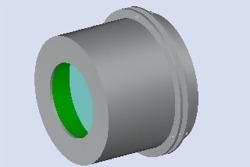 Current activity focuses on the development of very low power IR handheld gas detection sensors and related technologies, especially high-precision NDIR techniques and methods utilizing birefringent tunable Lyot style filters. We are also collaborating on novel signal processing techniques for fault detection and electrical energy conservation, such as Non-Intrusive Appliance Load Monitoring (NIALM) for facilities monitoring and electrical utility industries.